Your life practically runs on printed circuit boards (PCBs) and you may not have even known it. These circuit boards are in nearly all computational electronics, from smartphones to digital clocks. It works by routing electric signals through electronics, essentially telling the electricity where to go and bringing electronics to life. 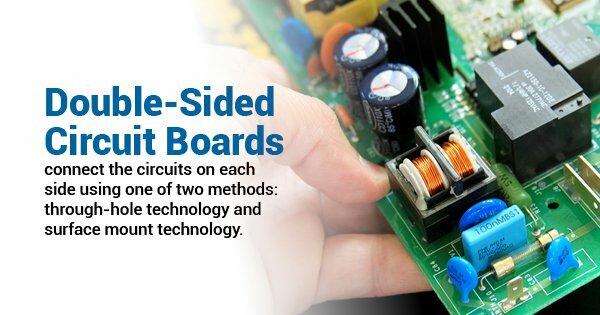 As the PCB manufacturing process and function of PCBS are rather complicated, there is a whole slew of relevant terms to know. Analog Circuit: A type of circuit in which the output varies as a continuous function of the input. This is in contrast with a digital circuit, which operates like a switch and can make logical decisions. Buried Via: This is a via, or a feed-through, that connects a top layer to one or more inner layers of the PCB. The buried via can be seen from just one side of the board when looking at it from the outside. CAD: Computer-aided design. This is a method in which a designer uses a computer and pattern equipment to develop a PCB layout before moving into the PCB manufacturing process. The design is typically a three-dimensional graphic. Chip on Board: Rather than first packaging integrated circuits, they are glued and wire-bonded directly to PCBs. This system is used for the electronics in many mass-produced toys. Double-Sided PCB: This type of PCB connects the circuits on each side using either through-hole technology or surface mount technology. Fabrication Drawing: This drawing aids in the PCB manufacturing process. Also known as a fab drawing, it shows all the locations of the holes that need to be drilled, their sizes and tolerances, dimensions of the board edges, and notes on the materials and process. Glob Top: Used for the chip on board method and on a packaged integrated circuit, it is a blob of non-conductive plastic that protects the chip and wire bonds. It is often black in color and has a low coefficient of thermal expansion so that temperature changes will not alter it. Package: A PCB component that contains a chip and protects it before and after attachment to a PCB. When soldered to a PCB, it serves as the electrical conduction interface between the chip and the board. Short: Otherwise known as short circuit, it is an abnormal connection of relatively low resistance between two points of a circuit. The current between these two points is often excessive and damaging. Terminal: In an electrical circuit, a terminal is a point of connection for two or more conductors. When you’re looking for PCB assembly services, it helps to know some of the terminology. While the experts will take care of the PCB manufacturing process, you’ll be able to discuss the specifics with confidence.